Put on you antlers, red noses and holiday attire and join The Villages Walkers on Thursday, Dec. 6, from 8 – 10 a.m. at the Springdale Fitness Trail for a 3 or 6 mile Jingle Bell fitness walk to benefit Angle Snugs Inc.
Monetary donations as well as yarn donations to make hats for children with cancer are welcomed and appreciated. Yarn requirements – Soft Acrylic Yarn, #4, and in bright colors please. On Thursday, Dec. 6, from 1 – 2:30 p.m. at The Villages Public Library at Belvedere in the Meeting Room, learn how you can stream and download music including today’s top hits, yesterday’s favorites, and a rich collection of classical, jazz, and world music. The Festival of Trees fund raiser for Special Olympics will have their silent auction on Thursday, Dec. 6 at 6 p.m. in the lobby of the Waterfront Inn at Lake Sumter Landing with 34 small beautifully decorated artificial trees on display, so join them and find out if your bid was the best and highest offer! Bids can be made for each tree, highest bid for each tree and other silent auction items wins that tree or item up for auction. All proceeds benefit Special Olympics Florida, Sumter County. For three nights starting Tuesday, Dec. 4- Thursday, Dec. 6 at 7 p.m., Nuncrackers, theNunsense Christmas Musical will take place at the Savannah Center. Tickets are $30 for Villagers and $35. for the public and can be purchased at: www.thevillagesentertainment.com. Imagine a group of Nuns putting on a Christmas Show on Cable Television with a group of talented students celebrating the Holiday and dancing the Nutcracker Suite. Now picture it with the Nunsense Nuns of Mt. Saint Helens joined by Father Virgil and the students resulting in Musical Pandemonium and High Comedy. A perfect way to start the Season! Nuncrackers is a hilarious Holiday Musical centering on the first cable broadcast from the Convent Basement built by Mother Superior with the lottery funds won in Nunsense. The song Christmas Time is Nunsense Time kicks off the story. The play features an uproarious take on the Tchaikovsky Nutcracker Suite and all new music including Santa Ain’t Coming to Our House, The Twelve Days Prior to Christmas, 364 Days a Year and Jesus Was Born in Brooklyn. This show is filled with Nunsense Humor, some of your favorite carols and a “Secret Santa” audience participation. It will make you laugh and tug at your heartstrings. This great cast includes the some of the best Villages Voices and a live band. Our lovely and talented Nuns are Carolyn Hoffman as Sister Robert Anne (Streetwise Nun), Holly Jeske as Sister Mary Paul (aka Amnesia), Mollie McCarthy as Sister Leo (Ballerina Nun), Billie Thatcher as Sister Hubert (Mistress of Novices) and Bonnie Williams as Sister Mary Regina (Reverend Mother). They will be joined by Bob Stehman as Father Virgil Manly Trott of the Trott Family Singers. Several talented students from the Villages Charter School are featured as Mount Saint Helen’s Students including Ethan Adams-Rae, Josie McDonald, MaKenzie Rees and Noah Winslett. Bob Stehman is Director, Kevin O’Connell is Music Director and Barbara Byers is Choreographer. Nuncrackers, Book, Music and Lyrics by Dan Goggin. Nuncrackers is presented by arrangement with Tams-Witmark Music Library, Inc.
A portion of the proceeds go to Villagers for Veterans and Patriot Service Dogs. Both are 501(c)3 Charities. Every Year the Sumter County Sheriffs Office collects gently used bicycles which are donated by Villagers for distribution to disadvantaged children throughout the county in time for Christmas. Drop off your bicycle donation at the Sheriff’s Office on CR466 anytime or bring it to the Lake Miona Recreation Center on Friday, Dec. 7 (the day of the event) between 8 a.m. and noon. Pickup is available by calling 352-259-2611 only on the day of the event. Your decision is the right decision. Take care of Tomorrow today! Join us for a free advanced directive workshop, Understanding Your 5 Wishes on Friday, Dec. 7 beginning at 9:30 a.m. at Creekside Care Center, 1050 Old Camp Road, The Villages. Hosted by Cornerstone Hospice & Palliative Care and The Villages Health, participants will learn about the nationally-acclaimed 5 Wishes process. To RSVP, call the Creekside Care Center at 352-674-1760 or register at https://thevillageshealth.com/learning-center/. On Friday, December 7, at 10 a.m. the Veterans’ Memorial Park of The Villages will commemorate the anniversary o the attack on U.S. Forces at Pearl Harbor, Hawaii. An Invitation to the program is extended to all veterans of all wars and their families, as well as to the general public. Our singer will be Tony Battalia and the speaker this year will be Benjamin Mack Jackson. The Sounds of Scotland will also be presenting music. The Veterans Memorial Park is located on Lake Mira Mar in Spanish Springs between Paige Place and the golf cart bridge over U.S. Hwy.27/441. The CERTS medical team will be in place for any emergency. Please remember to bring a chair for your comfort. VMP is a pet free park. On Friday, Dec. 7 beginning at 5:30 p.m. come out and enjoy Hometown Christmas, an annual celebration of the season filled with fun for the whole family. This Christmas event includes local entertainment, FREE activities for the kids including bounce houses, live DJ, food trucks, vendors, and a visit from Mr. and Mrs. Claus who arrive by fire truck! Registration is open to attend Hoopla Digital on Monday, Dec. 10 from 2:30 – 3:30 p.m. at The Villages Public Library at Pinellas Plaza in Library Meeting Room 162 where you can learn how to use Hoopla to find and read eBooks, Audiobooks, Music, Comics, TV shows and Movies. On Monday, Dec. 10 from 5:20 – 9 p.m. at Colony Cottage Recreation Center, go to a Gin Rummy Tournament where you will play 5 games against 5 different players, with 6-10 players heading to the two playoff rounds where you can win your entry fee of $5 and possibly a little more. Your decision is the right decision. Take care of Tomorrow today! Join us for a free advanced directive workshop, Understanding Your 5 Wishes on Tuesday, Dec. 11 beginning at 9:30 a.m. at the Mulberry Grove Care Center, 8877 SE 165th Mulberry Grove Lane, The Villages. Hosted by Cornerstone Hospice & Palliative Care and The Villages Health, participants will learn about the nationally-acclaimed 5 Wishes process. To RSVP, call the Mulberry Grove Care Center at 352-674-1750. On Tuesday, Dec. 11, from 1 – 3 p.m. at the Fruitland Park Library in the Meeting Room, go learn to knit by some wonderful folks, practice your knitting skills or just help others who are learning to knit. Everyone is welcome no matter what your level of knitting is. Group meets every week in the program room. On Wednesday, Dec. 12 from 11:20 – 3 p.m. at the Truman Recreation Center, go to a Gin Rummy Tournament where you will play 5 games against 5 different players, with 6-10 players heading to the two playoff games where you can win back your entree fee of $5 plus a little bit more. Join the Villages Environmental Discussions Group for a delightful and informative program on Wednesday, Dec. 12 from 12:45 – 2:45 p.m. at The Villages Public Library at Belvedere with our first guest speaker Steve Turnipseed, President, Villages Florida Native Plant Society. Steve will describe proper design and installation of a drip irrigation system. He will discuss how this system results in saving water and improving plant health. Bring along a few of your own plant questions, too. Our second speaker will be Amy Giannotti, Lake Division Manager for the City of Winter Park. Amy will inform us about the Cambrian Foundation. She will discuss featured projects including SS Commodore, Apopka Blue Sink, FL Springs Biodiversity Project, and various watershed clean-ups. Our programs are FREE. Bring along a neighbor. On Wednesday, Dec. 12, from 3:30 – 4:30 p.m. at The Villages Public Library at Belvedere in the Meeting Room, K through fifth grade kids can learn about STEM Station: Rush Hour Traffic Jam Logic Game. Registration is not required to attend. 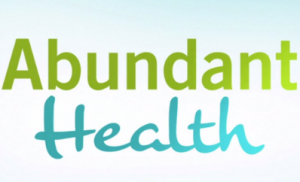 Abundant Health Naturally meets the second Wednesday of each month. Tonight, Dec. 12 from 6 – 8:30 p.m., at Laurel Manor Recreation Center, we will have guest speaker Maggie Wacker, RN, Phd, and Author. She will be telling us about the Doll House Project, an Educational and Therapeutic program which helps people with any kind of Memory Loss. After that we will be viewing an Episode or two from the Broken Brain Series, with Dr. Mark Hyman and associates. No Registration necessary! The Villages Railroad Historical Society presents their Christmas Train Show beginning on Thursday, December 13 – Saturday, Dec. 15 from 9 a.m. – 4 p.m. and on Sunday, Dec. 16 from 10 a.m. – 3 p.m. at the Colony Cottage Recreation Center. Scales represented will be: Standard, O,HO,N and Z. Over 8000 square feet of trains. Donations only. Free Parking. Raffle prizes. Join the Baha’i Study Group on Thursday, Dec. 13 from 1:30 – 3:30 p.m. for a discussion on Healing for a Divided World. Instead of getting your friends and family something from the store; residents have the opportunity to get them a handmade gift. The Glass Addicts will be hoisting a Holiday Glass Sale from 1:30 to 4 p.m on Thursday, Dec 13, at the Eisenhower Recreation Center in the Craft Room. Take a look at the original pieces the club members make, from jewelry to decorative plates and bowls. On Thursday, Dec. 13 at 6 p.m. come stroll through Log Cabin Park as it is lit up with hundreds of luminaries and enjoy the Town of Lady Lake Holiday Luminary Walk and Movie Night. Your decision is the right decision. Take care of Tomorrow today! Join us for a free advanced directive workshop, Understanding Your 5 Wishes on Friday, Dec. 14 beginning at 9:30 a.m. at Pinellas Care Center, 2485 Pinellas Place, The Villages. Hosted by Cornerstone Hospice & Palliative Care and The Villages Health, participants will learn about the nationally-acclaimed 5 Wishes process. To RSVP, call the Pinellas Care Center at 352-674-1720. The Asian American Club is having its Holiday Party at the Pimlico Recreation Center on Friday, December 14 at 5 p.m. This will be a pot luck dinner – this is where the best food is always enjoyable. Soda will be provided but feel free to BYOB. The Karaoke machine will be on from 7 to 9 p.m. to enjoy after dinner. Meeting times and location for 2019 have been changed. Our regular meeting will be on the fourth Thursday at La Hacienda Recreation Center. On Friday, Dec. 14, beginning at 6 p.m. bring your blankets, your chairs, some hot chocolate and Fruitland Park will bring the movie on the lawn at 506 W. Berckman Street. This year is a double feature with Chevy Chase in Christmas Vacation and A Christmas Story. Free popcorn sponsored by Leesburg Church of the Nazarene. On Friday, Dec. 14 beginning at 7 p.m. at Grace Tabernacle in Wildwood, come and experience “The Gift” during the holiday season. A memorable journey back in time to the birth of Christ. This awe-inspiring, dramatic musical presentation will be brought to you by a community cast and choir of over 150 people, featuring ‘In His Steps Dance Company.’ This is a major Broadway-style production with spectacular sets and costumes, beautiful aerial silk ballet, show stopping dance numbers, and extraordinary special effects and lighting. New Life Christian Church, 4701 E. CR 462 (Ext. of Powell Rd – .7 East of Hwy. 301) 352-633-3253. On Saturday, Dec. 15 beginning at 3:30 p.m. at Grace Tabernacle in Wildwood, come and experience “The Gift” during the holiday season. A memorable journey back in time to the birth of Christ. This awe-inspiring, dramatic musical presentation will be brought to you by a community cast and choir of over 150 people, featuring ‘In His Steps Dance Company.’ This is a major Broadway-style production with spectacular sets and costumes, beautiful aerial silk ballet, show stopping dance numbers, and extraordinary special effects and lighting. On Saturday, Dec. 15 beginning at 7 p.m. at Grace Tabernacle in Wildwood, come and experience “The Gift” during the holiday season. A memorable journey back in time to the birth of Christ. This awe-inspiring, dramatic musical presentation will be brought to you by a community cast and choir of over 150 people, featuring ‘In His Steps Dance Company.’ This is a major Broadway-style production with spectacular sets and costumes, beautiful aerial silk ballet, show stopping dance numbers, and extraordinary special effects and lighting. On Sunday, December 16, at 10 a.m., at the Canal Street Recreation Center, Terrence Fullerton will talk about, “The Current Crisis In The Catholic Church.” He will explain some of the problems that have plagued the Church that have caused divisions in recent times. On Sunday, Dec. 16 beginning at 7 p.m. at Grace Tabernacle in Wildwood, come and experience “The Gift” during the holiday season. A memorable journey back in time to the birth of Christ. This awe-inspiring, dramatic musical presentation will be brought to you by a community cast and choir of over 150 people, featuring ‘In His Steps Dance Company.’ This is a major Broadway-style production with spectacular sets and costumes, beautiful aerial silk ballet, show stopping dance numbers, and extraordinary special effects and lighting. 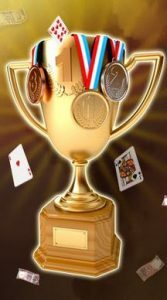 On Monday, Dec. 17 from 5:20 – 9 p.m. at Colony Cottage Recreation Center, go to a Gin Rummy Tournament where you will play 5 games against 5 different players, with 6-10 players heading to the two playoff rounds where you can win back your $5 entry fee and, possibly a little more. Regular Meeting – Club provides soft drinks, water and decaf coffee and table snacks. BYOB End of the year – BIRTHDAY BASH! Renewals and New Members accepted OR SIGN UP ON LINE. Your decision is the right decision. Take care of Tomorrow today! Join us for a free advanced directive workshop, Understanding Your 5 Wishes on Tuesday, Dec. 18 beginning at 9:30 a.m. at Colony Care Center, 280 Farner Place, The Villages. Hosted by Cornerstone Hospice & Palliative Care and The Villages Health, participants will learn about the nationally-acclaimed 5 Wishes process. To RSVP, call the Colony Care Center at 352-674-1710. On Tuesday, Dec. 18, from 10 a.m. – noon at The Villages Public Library at Pinellas Plaza in the Library Meeting Room 162, Florida residents with a hearing loss are eligible to receive a free amplified telephone from the non-profit Florida Telecommunications Relay, Inc. Cordless and corded phones for persons with mild to severe hearing loss will also be available. 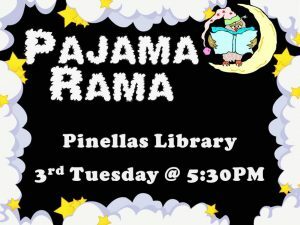 On Tuesday, Dec. 18 from 5:30 – 6:30 p.m. at The Villages Public Library at Pinellas Plaza in the children’s area, bring the kids ages 3 – 8 to Pajama Rama where they can enjoy a special pajama story time. Children may wear their favorite pjs. [vc_row][vc_column][vc_column_text]On Wednesday, Dec. 19, from 10:30 – 11:15 a.m. at The Villages Public Library at Belvedere in the Children’s area, It’s Story Time for children and their parent or caregiver are invited to participate in weekly story time programs at the library. 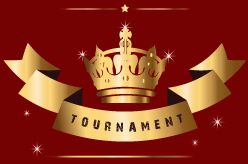 On Wednesday, Dec. 19 from 11:20 – 3 p.m. at the Truman Recreation Center, go to a Gin Rummy Tournament where you will play 5 games against 5 different players, with 6-10 players heading to the two playoff finals, depending on the number of entrees. Jody Nelson of the Spice and Tea Exchange will be our speaker. We will enjoy an afternoon tea as she explains the history of tea. We will also present a Quilt of Valor to a Korean War Vet. Bring you cups and saucers.. Merry Christmas!! On Friday, Dec. 21, at the American Legion Auxiliary, John Gella Memorial Post 219, meets the third Friday of every month at 5 p.m. for a lite supper, followed by a game of Meat Shoots at 6 p.m. So come, bring some friends, have a good time and win some meat! On Friday, Dec. 21, from 6:30 – 9:30 p.m. at the Wildwood Community Center, the First Annual Christmas Gala Fund Raiser with be held to help our organization, Creative Imaginationz, establish roots in the city of Wildwood, FL. This event will aid our local youth with afterschool activities to enrich their lives and to assist adults with communication skills, leadership skills, organizational skills, resume skills, and to establish the “Ready 4 Work, Ready 4 Life” program. All donations are tax deductible. Thank you for partnering with us as we endeavor to enrich the lives of all our stakeholders. This activity is hosted by The Nabiim, Inc., a 501(c)3 organization. Also, we are registered with the State of Florida’s Department of Agriculture and the Department of Consumer. 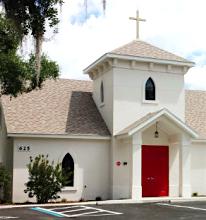 Grand opening of the Lake Deaton Campus of New Covenant United Methodist Church. Everyone is invited to celebrate the season! Services will be held at 8:00am (Contemporary); 9:30am (Blended); and 11:00am (Traditional). Christmas Eve services at 5:00pm and 7:00pm for Carols and Christmas Stories. These are all “come as you are” services! The Campus is golf cart accessible from The Villages. On Sunday, Dec. 23 beginning at 9:30 a.m. at St. Alban’s Anglican Church in Lady Lake, a traditional Christmas Celebration of Nine Lessons and Carols commemorating the birth of Jesus Christ. On Sunday, December 23, from 10-11:30 a.m. at the Canal Street Recreation Center, come to the Humanists Alternate Program Meeting to enjoy an informal setting for Humanists to play some trivia and have a group discussion. Grand opening of the Lake Deaton Campus of the New Covenant United Methodist Church. Celebrate with us on Christmas Eve with services at 5 p.m. and 7 p.m. for carols and Christmas Stories. These are “come as you are” services! The Campus is golf cart accessible from The Villages. On Wednesday, Dec. 26 from 11:20 – 3 p.m. at the Truman Recreation Center, go to a Gin Rummy Tournament where you will play 5 games against 5 different players, with 6-10 players heading to the two playoff finals, depending on the number of entrees. 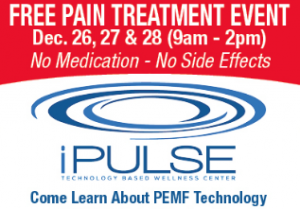 on Thursday, Dec. 27 and Friday, Dec. 28 from 9 a.m. to 2 p.m.
We offer PEMF Therapy and Whole Body Vibration Therapy. Both of these therapies focus on healing you from the cellular level, which is at the root of all pain. If you have tried everything else with little results, give us a try, you will be very happy you did. Our therapies are non-invasive, no medications and no side effects. Due to popular demand to conduct the meeting after the Holiday, The Villages Tinnitus Support Group will be meeting on Thursday, December 27, 2018 at 3:30 p.m. at the Churchill Street Recreation Center. All are welcome. on Friday, Dec. 28 from 9 a.m. to 2 p.m.
On Friday, Dec. 28 from 10 – 11 a.m. at the Lady Lake Public Library in Study Room 152, OA meets every Friday. For more information, contact Nancy at 352-259-7810. On Sunday, December 30, from 10-11:30 a.m. at the Canal Street Recreation Center, come to the Humanists Alternate Program Meeting to enjoy an informal setting for Humanists to play some trivia and have a group discussion. On Wednesday, Jan. 2, from 10 a.m. – noon at The Villages Public Library at Pinellas Plaza in Library Meeting Room 162, learn how to create, modify, and save hundreds of everyday personal, and business legal documents. Play 5 games against 5 different players, with 6-10 players heading to the two playoff rounds. On Wednesday, Jan. 2, from 2 – 3 p.m. at The Villages Public Library at Pinellas Plaza in Library Meeting Room 162, explore your creativity and meet new friends at the Coloring Book Club for Adults. The Villages Prostate Education and Support Group Monthly Meeting will be held on Wednesday, Jan. 2 from 7 – 9 p.m. at Laurel Manor Recreation Center. Dr. Richard Roach of Advanced Urology Institute will speak regarding cyrotherapy as a treatment for prostate cancer and erectile dysfunction. 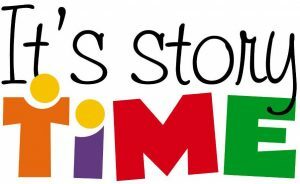 On Thursday, Jan. 3, from 10:30 – 11:15 a.m. at The Villages Public Library at Pinellas Plaza in the Children’s Area, kids and their parent or caregiver are invited to participate in weekly storytime programs at the library. On Thursday, Jan. 3, from 2:30 – 4 p.m. at The Villages Public Library at Belvedere in the Meeting Room, find the websites and eBooks that will make your next trip easier to plan. A Raise the Roof Fund Raiser and Community Yard Sale will take place on Saturday, Jan. 5 from 8 a.m. – 1 p.m. on the grounds of the Melon Patch Theatre with all purchase proceeds and monetary donations going towards our building maintenance and repair fund. The Deep Sea Fishing Club of the Villages meets on the first Saturday of each month at 9 a.m. in the Paradise Recreation Center. Our next meeting is Saturday, January 5, 2019. Party boat trips into the Gulf are planned for the Thunder out of Hernando Beach on January 17, 2019. Also flats fishing trips on the Gulf near Cedar Key/Crystal River/Yankeetown or other locations are available using pontoon boats, shallow craft boats piloted by licensed captains. These 4-hour trips are scheduled based on best fishing times, so departure times will vary. Come early for coffee and donuts and purchase tickets for free fishing trips that will be given away in chance drawings. For information call Mo Davison 352-643-0443 or John Kluck 352-633-6060 or visit our web site to view more : www.deepseafishingclub.org. The Humanists Club meeting will take place on Sunday, January 6, at 10 a.m. at the Canal Street Recreation Center. Dr. George Erickson will present, “Why Is The American Humanists Association Supporting Actions That Are Worsening Climate Change? Dr. Erickson is a past president of the Minnesota Humanists and a past vice-president of the American Humanists Association. Sponsored by The Villages Friends of the Library. On Monday, Jan. 7 from 5:20 – 9 p.m. at the Eisenhower Recreation Center, go to a Gin Rummy Tournament where you will play 5 games against 5 different players, with 6-10 players heading to the two playoff finals, depending on the number of entrees, where you can win back the $5 entry fee and, possibly, a little more. This game has moved to Eisenhower to accommodate the AARP Tax Aid at Colony Cottage until the end of tax season. On Tuesday, Jan. 8 from 10 – 11:30 a.m. at The Villages Public Library at Belvedere in the Meeting Room, join an informational program about Bone Health. Aqua Yoga meets every Tuesday at 11 a.m. at the Colony Cottage Sports Pool. Beginning Yoga postures (asana) practiced in water cause less stress on joints. Buoyancy holds you up, the water’s resistance builds strength, and the aqua environment provides a greater range of motion. Students should bring 2 pool noodles. Restoration Day will be celebrated at the Supervisor of Elections Office in Sumter County, FL and in many other counties throughout the State on January 8, 2019 at 11 a.m. at the Sumter County Supervisor of Elections in Wildwood, FL. have the opportunity to restore their right to vote and enjoy full citizenship. Criteria for the ability to register and vote in elections include the following: Completion of all terms of their sentences, release from prison (if the person was imprisoned), completion of probation and parole requirements, payment of all fines and fees, payment or fulfillment of all restitution requirements. On Wednesday, Dec. 27 from 11:20 – 3 p.m. at the Truman Recreation Center, go to a Gin Rummy Tournament where you will play 5 games against 5 different players, with 6-10 players heading to the two playoff finals, depending on the number of entrees. Villages Environmental Discussions Group will host its first meeting of 2019 on Wednesday, Jan. 9, from 12:45 to 2:45 p.m. Our guest speaker will be Michael Roth, President, of a non-profit corporation called OUR SANTA FE RIVER (OSFR). The OSFR has eleven board members. Michael’s education earned him bachelor’s and master’s degrees. As a CPA, he became a partner in a CPA firm. As President of OSFR, Michael works with members of OSFR to do activities like cleaning out trash from an enormous sinkhole in Fort White…..to running an OSFR fundraiser on a weekend. He and other OSFR officers and members also attend and make presentations at important Board meetings at various locations of the county. Come hear Michael describe the work OSFR voluntarily performs to support the aquifer, springs and rivers of the Santa Fe River. Bring your questions and offer support to Michael and his organization’s colleagues. Bring your neighbor to this program. Questions? Email: raivedg@gmail.com. 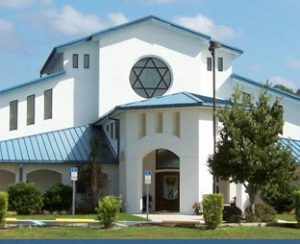 Temple Shalom of Central Florida will be presenting a play called “Remember The Alimony” by Steve Young. The story is about one man, his three marriages and divorces, and how he examines his relationships with each of his wives. Steve Rubin will be directing a staged reading of this newly written comedic play. Open Auditions will be held at Temple Shalom, 13563 CR 101, Oxford, on Wednesday, Jan. 9th at 2 p.m. and Thursday, Jan.10, at 3 p.m., Material will be supplied for cold readings. The Production will be held on Saturday, March 30 and Sunday, March 31, at 7 p.m. and 3 p.m. respectively at Temple Shalom. If you need additional information, please contact Steve Rubin at 561- 352-0874. On Wednesday, Jan. 9, from 2:30 – 3:30 p.m. at The Villages Public Library at Pinellas Plaza in Library Meeting Room 162, find the websites and eBooks that will make your next trip easier to plan. 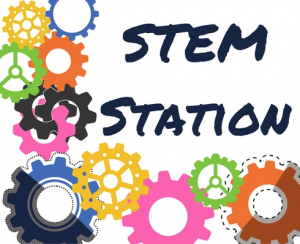 On Wednesday, Jan. 9 from 3:30 – 4:30 p.m. at The Villages Public Library at Belvedere in the Meeting Room, kids (K-5th Grade) ages 8 and up will pair in teams using STEM skills to complete the falling marble logic game challenges. Join us for this month’s Abundant Health Naturally meeting on Wednesday, January 9, at 6 p.m. at Laurel Manor Recreation Center. Guest Speaker Ilyse Rothman, Certified EFT Specialist will talk about the healing power of emotions. She will share 3 steps to healing from the inside out and will conduct an EFT (Emotional Freedom Technique) Tapping/Healing Session for us. We will also be showing a video segment from the Broken Brain series with Dr. Mark Hyman (Cleveland Clinic) and his associates. This is a very uplifting series about prevention and treatment of dementia, Alzheimer’s and other brain issues. No Registration necessary! Questions? Call Jan Smith at (419) 340-0555. On Thursday, Jan. 10 from 10 – 11 a.m. at The Villages Public Library at Belvedere in the Meeting Room, go explore your creativity and meet new friends at the Coloring Book Club for Adults. Republican Women will meet Thursday, January 10, from 10 a.m. – noon at the Bacall Recreation Center, Canal Street. Doors open 9:30 a.m. Meeting starts 10 a.m. The Baha’i Study Group will continue its several part series: Healing a Divided World. Our discussion will focus on New Year’s Resolutions for a New World. This past month marked the 50th anniversary of the Apollo 8 mission where the astronauts took the iconic photograph of the earth as seen from the moon. That vantage point gave us a whole new perspective of this planet. Unbeknownst to many, about 100 years before that, Baha’u’llah, Prophet-Founder of the Baha’i Faith stated “the earth is but one country and mankind its citizens.” Join us to discuss the implications of this spiritual reality and how it impacts our new year’s resolutions. On Thursday, Jan. 10 from 2:30 – 4 p.m. at The Villages Public Library at Belvedere in the Meeting Room, learn how to create, modify, and save hundreds of everyday personal, and business legal documents. Open Auditions will be held at Temple Shalom, 13563 CR 101, Oxford, on Thursday, Jan.10, at 3 p.m., Material will be supplied for cold readings. The Humanists Alternate Program meeting is an informal setting for Humanists to play some trivia and have a group discussion. The American Legion Auxiliary Unit 347 Fund raiser for Sgt. Pam Kelly will be held on Sunday, Jan. 13 at 5 p.m., with a Spaghetti Dinner and Dance and entertainment by Al Brady. Tickets are $15. per person and can be purchased at the American Legion Post in the Office or Lounge. There will be basket raffles, 50/50 and door prizes. Sgt. Pam Kelly is a 17 year Army Veteran who was injured on a training mission which caused her to become a paraplegic. The Villagers for Veterans spearheaded a project to move Sgt. Kelly to The Villages to enable her to have some independence getting around on the golf cart paths and build her a Smart House. The American Legion Auxiliary Unit 347 is helping with this Project. On Monday, Jan. 14, 10 a.m. – 4 p.m. Friends of the Villages Library will have a Book sale at The Villages Public Library at Pinellas Plaza in Conference Room 102. On Saturday, Jan. 19 from 1 – 4 p.m. at the Fenney Recreation Center, Villages residents are invited to attend an open house wth the Lake Sumter Lions Club. Meet your neighbors who are members of the world’s largest service organization and see what we can offer you as a Lions Club member. While there, especially trained Lions will be conducting diabetes and diabetic retinopathy pre-screenings. On Monday, Jan. 14 from 5:20 – 9 p.m. at the Eisenhower Recreation Center, go play 5 games against 5 different players with 6-10 players moving to the 2 playoff rounds. On Tuesday, Jan. 15, 2019 at 7 p.m., guest speaker Laurie Cardoza-Moore, founder of Proclaiming Justice for The Nations (PJTN) will speak at Temple Shalom. In a recent article published by the ADL, Florida continues to be in the top four states reporting incidents of anti-Semitism, with New York, New Jersey, and California. Save the date to hear Laurie speak. This event is free to members and the public. 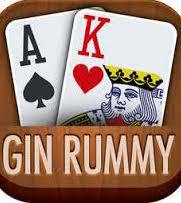 On Wednesday, Jan. 16, from 11:20 – 3 p.m. at the Truman Recreation Center, go to a Gin Rummy Tournament where for only $5, you will play 5 games against 5 different players, with 6-10 players heading to the two playoff finals, depending on the number of entrees, to win back your entry fee and more. On Wednesday, Jan. 16 from noon – 2 p.m. at The Villages Public Library at Pinellas Plaza, bring your lunch and watch a movie called Ocean’s 8. Debbie Ocean recruits seven women to help her steal a $150 million necklace at the Met Gala. On Wednesday, Jan. 16 from 2 – 3 p.m. at The Villages Public Library at Belvedere, join a library staff member for an informative book discussion on Three Things About Elsie. An injured woman who meditates on her complicated relationship with a best friend when a man they believed was dead joins her retirement community.